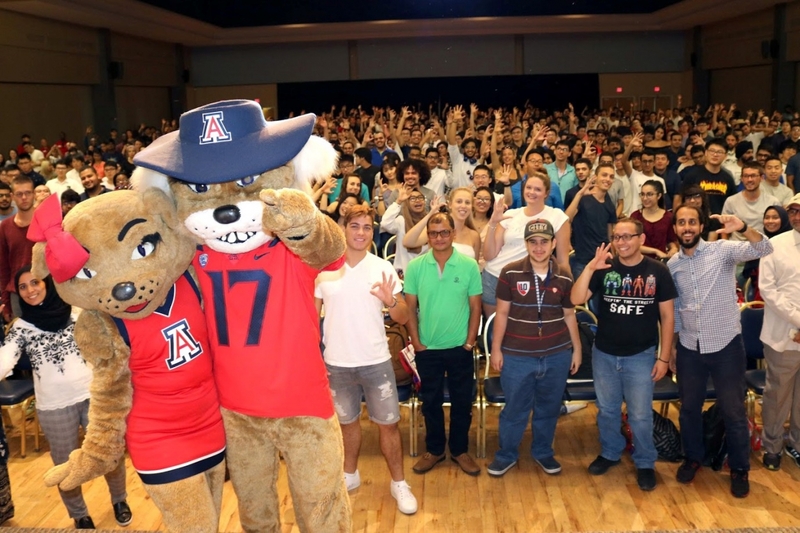 Dr. Robert C. Robbins welcomed roughly 1,000 international students to the University of Arizona for the fall 2017 semester during an energetic presentation at the Student Union Memorial Center Grand Ballroom. During the first day of International Student Orientation, students representing more than 100 countries connected over laughter and a visit from Wilbur and Wilma. Robbins made it clear the UA has an abundance of activities, and he encouraged international students to get involved. UA Athletic Director Dave Heeke also tapped into the global wildcat spirit during an event at Gallagher Theater, explaining the “Bear Down” chant, the wildcat nickname and the famous "WC" hand symbol. Organized by International Student Services within the UA Office of Global Initiatives (OGI), International Student Orientation included three days of activities, ranging from informational sessions and campus tours, to pancake breakfasts and a party at the Rec Center. Upon speaking with several international students from the fall class, a common theme emerged. Robbins acknowledged the trend of declining international student numbers across the United States, but also assured students they are welcome at the UA. “Because of a variety of different political events, the number of international students coming to universities across the United States is down, and that’s unfortunate,” he said. “But I am very confident that you are going to have a great experience here,” he told the crowd. Over the past 10 years, the UA has experienced a significant uptick in international students, with roughly 2,300 in 2007 to approximately 4,000 today. Beyond the invaluable academic and cultural contributions international students bring to the community, they also make a deep economic impact. The latest figures from NAFSA: Association of International Educators, a non-profit dedicated to international education, estimate that international students from the UA contribute $162.4 million to the economy and support 2,442 jobs annually. The highest percentage of spending occurs in higher education, followed by accommodation, dining and retail. Robbins recognized that globalization is fueling rapid change in all aspects of students’ lives, from the way they shop to the way they travel, and he highlighted the importance of international education in staying ahead of the curve. “The world is changing rapidly, and you are part of it. 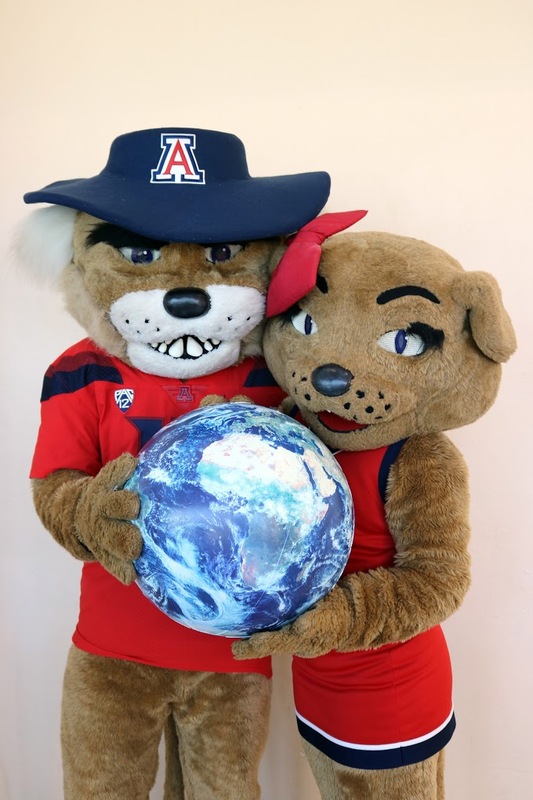 You are part of this globalization that’s sweeping the world at a very rapid rate, and the University of Arizona is really embracing this change,” he said. Housed within the UA Office of Global Initiatives, International Student Services or ISS assists with immigration guidance, academic resources, cultural connections, and social events. For more information about specific programs, visit https://global.arizona.edu/international-students. Pictured above: Joanne Lagasse-Long, director of International Student Services, Dr. Robert C. Robbins, president of the University of Arizona, and Suzanne Panferov, interim vice president of Global Initiatives. Photos by Christine Scheer.